What Do We Prepare For? Many people think of preparedness as preparing for the “apocalypse” where a major event or series of events occur decimating our way of life as we know it. For some it is a pandemic, others it is an economic collapse. Not that these events aren’t plausible and at risk of occurring, however the likelihood or probability of occurrence is much lower that other emergencies that we face day to day. If we neglect to prepare our families for these smaller events, we are in fact weakening our family preparedness capability to overcome much more common events such as a house fire, layoff, robbery, flood, or tornado. Now that I am sure I have aggravated a few “apocalypse preppers” out there, let me follow-up my initial comments with this. By preparing for the smaller, more common events, we are also preparing our families to face the larger events as well. We have to be able to crawl before we can walk. As in business as well as prepping, it is much easier to accomplish smaller preparedness goals which then serve as building blocks to a much larger goal. We can accomplish this in a three step process of Identification, Examination, and Preparedness. Above we mentioned to look at preparedness in “small bite sized chunks”, so where do we start? Below is a list of hazards and threats that face our country. It is by no means a comprehensive list, but it’s a start. Take a look at this list and identify the hazards and threats that could impact your area. Evaluate and focus on those that impact you. Then prioritize the ones that occur more often or are more likely to occur than the others. Are you new to the area and are not familiar with what impacts you could face? If so, do a quick google search on hazards in your area. You have to know your area and the threats you face before you can start to prepare. Don’t just forget about the hazards and threats that you don’t think impact you. At this point do a little research before ruling them out. Remember many families are dynamic, we move around throughout our daily lives, travel etc. Take a step back and look at locations you frequently visit, see if these hazards are an issue in those locations, if so, don’t rule them out, prioritize them just as you did above. If you are unsure how to prioritize the hazards and threats, here are a few factors that you can consider to help you with prioritization. Occurrence or Likelihood – How often or how likely the hazard or threat is to occur. Higher occurrence or likelihood should mean higher the priority. Magnitude – How severe can the hazard or threat become. Think “worst case scenario”. Higher magnitude would be higher priority. Cascading Impacts – What other impacts are there on systems or infrastructure caused by an occurrence of this hazard that can impact your family. The more cascading impacts, the higher the priority. Timing – Are there different times of day that would make you more vulnerable to this hazard or threat if they were to occur? Identifying how each hazard or threat can impact your family and how to overcome or mitigate the impacts is the key to preparedness. In most cases examining at the cascading impacts is essential, followed by examining the other factors independently and how they may change your response to the problem. Let’s look at a flooding scenario for example. You are a parent of three kids and are already at work for the day 20 miles from home. Two of your children are at day care for the day while the other is in intermediate school. In addition, your spouse is gone on business travel for the week out of state. Your town is used to rainfall and usually drains well, but it can flood if you get higher amounts of rainfall in a short period of time. The meteorologists said rainfall was predicted for the area for the day but the exact amounts were unknown. About an hour after you got to work and the kids made it in to school/day care, the skies let loose. Heavy rain, about 2-3 inches per hour. No big deal right? We always get a little heavy rainfall, it will stop soon, so you get back to work. Every hour or so you check the window, it is still raining. 4-5 hours later, around lunch time, it is still raining, just as heavy as when it started. It clicks in your mind that the rainfall hasn’t stopped, so you turn on the radio. You hear rainfall totals for the event are now upwards of 10-11 inches across the area. 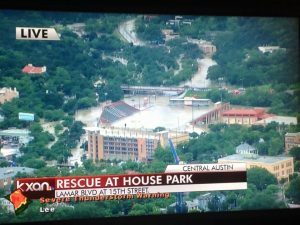 You turn on the news and hear the streets are flooded, many with over a foot of water and impassible. Water is starting to impact homes and business in your area, and the weatherman says more heavy rain is expected over the rest of the day. They are now thinking totals upwards of 15 inches. The rainfall totals keep rising and so do the flooding impacts. What goes through your mind? Is there water impacting the school? Is there water impacting the daycare? What is the school planning to do because of the situation? What is the day care planning to do? If the school or daycare is taking on water, what are they doing with my kids? Now that the roads are flooded, how am I going to get to the rest of my family? Can I communicate with my kids? If so how? Can I communicate with my spouse? Can my spouse help me in any way? Is our house ok? Is it being flooded as well? How will I communicate with my family if the power does go out? So let’s examine how we could plan for this scenario. The hazard is the flood caused by the rainfall. We know flooding is somewhat common in the area, but not usually to this extent, therefore the occurrence is relatively high. Since we know historically it can get bad, so is the magnitude. In this case we had very little warning time prior to the start onset of the incident. What cascading impacts could also potentially occur if this continues or could be occurring already that you are not aware of? These cascading impacts are what you prepare for. When you identify the cascading impacts caused by the hazard you can work the problem ahead of time and create your game plan for how you can handle the situation when it occurs. By doing this, you are alleviating many of the questions that were going through the mind of the parent in the above scenario and allowing yourself to better respond to the problem. Let’s look at a few from the above scenario and identify things we can do to plan for them. Communication with children in school. Identify ways to enable communication with your children or the school. Document the contact information for the school, school district, and day care facilities. Get as much contact information as possible, phone and email. Remember, being able to make contact during times of emergency is when it counts. In addition to the main numbers for the facility, get a direct number to their teachers or the facility director if possible. Remember, text messages and emails have a better chance of getting through when cell towers are overwhelmed or system coverage is limited. Discuss the school safety plan for flooding, how they plan to take care of the children in the event that they are stranded and cannot leave school. Ask the same information of the child care facility. Identify the emergency notification system utilized by the school or child care facility and get registered for the notifications. Check your information once or twice a year to make sure it is still up to date. The start of each semester is a great time to review your information. Consider going cellular with your children. If your child is old enough, consider giving them a cellular device for emergencies only. This doesn’t have to be the latest iPhone or Android (granted those will work but they tend to be more expensive, and have greater security concerns). It can be a pay per use “go phone” that you can use to communicate with them via phone call or text message. In many cases, if the cell towers are operational, this can give you immediate insight to their needs and wellbeing during times of emergency. Teach your children how to use a landline phone, yes a land line. They still exist, contrary to many children’s beliefs and are present within the school. Use your neighboring resources. Raising children truly does take a village, don’t be afraid to contact neighbors or friends in the area to check on what the school or child care facility is doing. They may not be able to pick your children up from school, but they can at least give your insight to what the school is doing impacts in the area and to your home. Talk with your school representatives so you understand their emergency transportation plans. How do they evacuate and where do they evacuate to in the event one is required. Build your emergency pick-up list. If you have a neighbor or family member close by that you trust your children with, consider adding them to the emergency pick-up list at your child’s school or child care facility in case you cannot make it there to pick them up. In some cases you may have to have this completed ahead of time, so check with you care provider. Develop an emergency bag to keep with you in case you are stranded and have to wait it out or get home using a different means than usual. Include emergency food, water, cash, a change of clothes, hygiene items, comfortable shoes, and a way to recharge your cellphone. Here are a few cell phone charger options in different sizes we have had success with Anker PowerCore+ Mini, Tenergy ARC5200, Anker Astro E5. Build out your emergency bag for 72 hours. 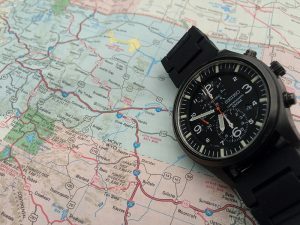 We recommend building up to a full Bug Out Bag to keep with you or in your vehicle that will sustain you for 72 hours, especially if you work more than 15 miles from home. Our free Bug Out Bag Checklist is available here to help you develop your own. Backpack emergency kit for children. Prepare a minimal emergency supply kit for your children to keep in their backpack or diaper bag that goes with them to school. Include an emergency card until your kids are old enough to remember the information themselves. Children can forget important information during stressful situations and this can act as a flash card. In addition, if the school or child care facility has to evacuate, they may not be with the normal teachers they are with every day. Include a few likeable snacks that can be carried compactly and have a long shelf life (such as granola bars or dried fruit) and a bottle of water. A comfort item or toy is always good if there is room. For the little ones, add wet wipes, extra diapers and cream. For the older kids with a cell phone, include a cell charger solution as well. If they are old enough, let them know what the emergency kit is and what it is there for. As with all emergency kits, check them at least twice a year. How would the questions mentioned above or your response change if you were in a different location? What if you had more warning? How would this be different if you were a family where one person stayed home? When you are planning for these hazards, remember to look at the dynamic factors that impact and how you would respond differently. 2014 Gallup Poll). The majority of this is away from home, not including the drive time. That means over a quarter of the time in a 7 day week are spent away from the home where family members are split up in different locations. It is extremely important to consider how you will handle hazards and threats when you are both at home and away. Are there different times during the day when you are more vulnerable to a hazard? For example, nocturnal tornadoes (tornadoes that occur at night) are much more deadly that those that occur during the day. A study by Northern Illinois University concluded, the fatality rate from nocturnal tornadoes are 2.5 times more likely to kill as those occurring during the daytime hours (Source: Weather.com). It boils down to the simple fact that we are just more vulnerable when we are asleep or with things we can’t see. When you are asleep how will you get the warning? Will it wake you up? Do your children know where the safe room is in the house so they can get there on their own? Consider timing and how it may change your response when you look at the hazards that threaten your family. Your family’s success during emergencies and disasters is greatly dependent on your ability to analyze, understand, and adapt to your environment around you. Understanding the hazards that you face in your area or where you travel is a part of this analysis that you can complete before the incident occurs. In addition to being more able to handle a situation, pre-planning can also serve as a type of stress inoculation during times of emergency. Since you already have a plan in place, your mind is freed up to focus on other challenges at hand. Once you have a game plan, share it with your family, and practice it as a team. A plan is of no use if you do not share it and practice it with each other. This run-through will also help you identify gaps that may exist in your plan or items that you may want to “tweak” to make it more efficient or effective. Practice is the most important follow-up step once your plan is made. Don’t set your plan up for failure by forgetting to test it out. You now have a process to identify hazards, and a framework to start examining their impacts so you can continue your flight of family preparedness. Fine tune your planning by visiting some of the included links and checklists where we elaborate on specific planning areas, as there is just too much to cover in one post. If you think of something we missed or have a personal experience in hazard identification and planning, please let us know by commenting below.